Human culture is a strange and wonderful thing. I’ve been reading about a genre of folk stories that have as a central character a “hog-faced woman,” and I’m left shaking my head at the uncanniness of human imagination. These tales seem to have arisen in the early 17th century concurrently in England, The Netherlands, and France. Most of the stories begin with a rich woman refusing charity to a beggar and her children, calling them “piggish” for asking for alms. The beggar turns out to be a witch who in revenge curses the child in the woman’s womb. The child is born perfectly healthy but with the face of a pig. Now Sir, you have given me that which all women most desire, my Will, and Soveraignty; and know I, was by a wicked and sorcerous step-dame inchanted, never to returne to my pristine shape, till I was first married, and after had received such power from my Husband · And now from henceforth I shall be the same to you night and day, of that youth and lively-hood which you now see mee; till Time and Age breed new alteration, even to the last period of my life. “That which all women most desire, my Will, and Soveraignty”: isn’t that wonderful? One thing I find fascinating about this story is that it doesn’t display the early modern period’s affinity for correspondences in physiognomy. As Laura Gowing argues in her book Common Bodies: Women, Touch, and Power in Seventeenth-Century England, “In the literature of monstrous births, women become the conduit by which bestial features of body parts–in some cases, whole animals–found their way into human reproduction. Seeing a hare could cause a hare-lip; a jockey’s wife might give birth to a child with a horse’s head.” Given the resemblance of the woman’s face to a pig, the reader might expect to hear Tannakin described as hungry, greedy, gluttonous, and bestial. Instead, she shows great patience, indulgence, and wisdom. There is also the (IMO underrated) movie Penelope starring Cristina Ricci. There are too many similarities—the nose, the marriage, the curse—for it to be a fluke. Here’s the trailer. As we’ve seen, in the tale of Tannakin Skinker, the “hog-faced woman” character is allowed to choose her own fate. She has agency and control. This theme is pushed even further in Penelope, in which the main character runs away after meeting cute with her potential husband. The plot is too complicated to get into, but suffice to say that Penelope breaks the curse by learning to love herself with the help of Reese Witherspoon in a fine turn as a Vespa-riding sub-category of the Manic Pixie Dream Girl. Is it cheesy? Yes. Do I love it anyway? Yes. And do I think it’s a fascinating twist on a centuries-old tale that reveals much about 21st-century American ideals of beauty, individualism, and self-actualization. You betcha. Gowing, Laura. 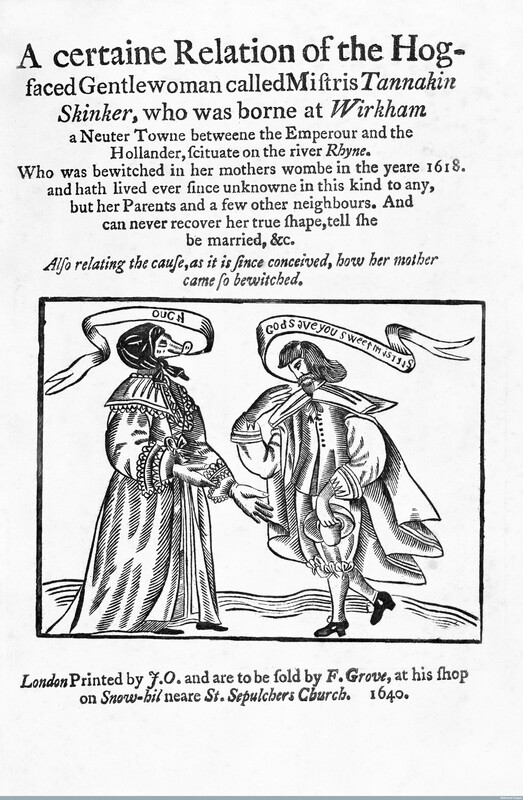 Common Bodies: Women, Touch, and Power in Seventeenth-Century England. New Haven: Yale UP, 2003. Kathy Haas talks about “The Hog-faced Gentlewoman Called Mistris Tannakin Skinker” in The Rosenblog: From the Staff of the Rosenback at the Philadelphia Free Library.